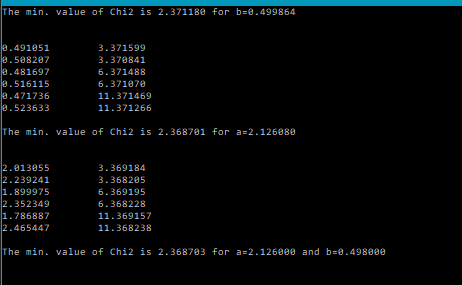 Fitting a dataset (xi,yi,si) using a curve y=f(x)=a*exp(bx), where values of the parameters a and b are unknown, but defined within a set of range. 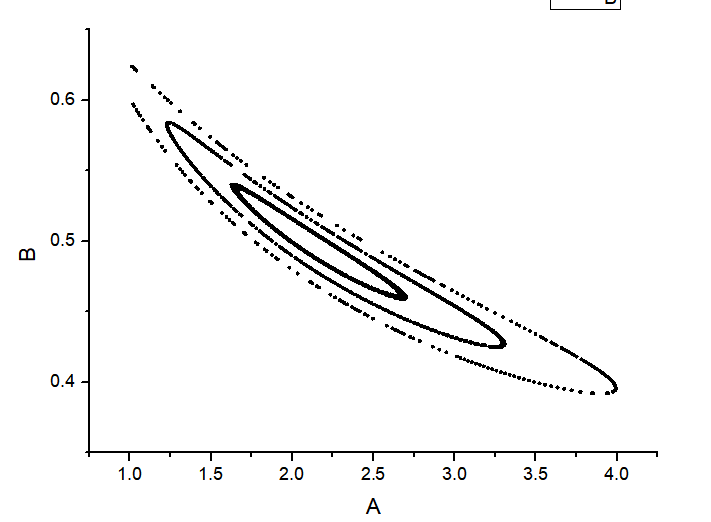 Prob1: Tabulate and plot 𝜒2(𝑎=2.101,𝑏) vs b (in steps of 0.1). (i) Find the value of b for which 𝜒2(𝑎=2.101,𝑏) is minimum 𝜒𝑚𝑖𝑛2. Prob2: Tabulate and plot 𝜒2(𝑎,𝑏=0.498) vs a (in steps of 0.1). (i) Find the value of a for which 𝜒2(𝑎,𝑏=0.498) is minimum 𝜒𝑚𝑖𝑛2. Prob3: Tabulate and plot 𝜒2(𝑎,𝑏) vs a, b (both in steps of 0.1). (i) Find the values of (𝑎,𝑏) for which 𝜒2(𝑎,𝑏) is minimum 𝜒𝑚𝑖𝑛2. Plot a vs b. (ii) Find the values of (𝑎,𝑏) for which 𝜒2 value is 𝜒𝑚𝑖𝑛2+1. Plot a vs b. (iii) Find the values of (𝑎,𝑏) for which 𝜒2 value is 𝜒𝑚𝑖𝑛2+4. Plot a vs b. (iv) Find the values of (𝑎,𝑏) for which 𝜒2 value is 𝜒𝑚𝑖𝑛2+9. Plot a vs b.